The AdWords content network has been the source of heartbreak and of joy for countless advertisers over the years. There are many opinions on the content targeting and placement targeting but the general consensus is that those new to AdWords should avoid it until they understand it fully. That is about to change. We were recently invited to participate in the new AdWords UI beta. Things have really changed a LOT and to be honest, I don’t really like it yet but there is one feature that really jumped out me as a game changer, the new “networks” tab. ..
Below you will find some screenshots of the new interface. Please note that I have removed any data that has identified the campaigns. These details are simply deleted and are indeed included in the interface. Please click images for full sized shots. The new interface is a streamlined, ajaxified beast with a lot of new features. You’ll notice straight off the bat that the interface has been adjusted to look like Google analytics. 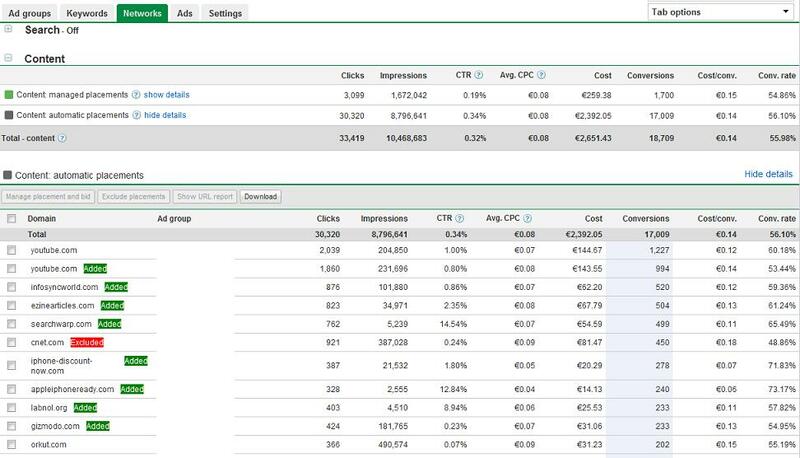 In fact, the transition between AdWords and analytics is now seamless, complete with all the ajax progress animations. There is also an option to collapse the left sidebar (not shown) which includes a list of campaigns for easy access, similar to AdWords editor. The one feature of note however is the new “networks” tab in each campaign. This tab lists the networks that your campaign is running on. Either search, search partners, content network and defined placements. The best part however is the content network automatic placements! Previously, the only way to access this data was to through a tedious process of creating a placement performance report for the date range you wanted. Then you had to wade through the data with the awful pagination Google provides in it’s reports (what can we really do with 100 rows Google?). You also had to manually select your campaigns. Not any more. Now you can see day by day metrics on each URL that your ads appear on the content network without running a placement performance report! And that’s not the best part. With the new view, you can sort the columns in order of the metric of your choice, check the URLs that are performing to that metric and automatically add them to your placement campaigns! (Now called “Managed Placements” as seen). To those of you who that were willing to put in the hard slog and suffer the sometimes agonizing wrath of the content network and placement campaigns you will realize how much of a fantastic new time saving feature this will be. This cuts out what can be hours of research time looking for decent performing placements. The interface is still in very early beta. It errors out at least 2 times a session for me every time I have tried it. This has been a common complaint so I doubt it will be released any time soon. Now, if Google could provide some cross segmentation options and integrate the bizarrely missing display ad builder tool, this will be an absolute hit. Great stuff Google!